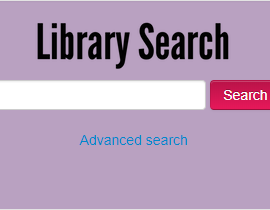 The new Library Search interface will go-live on Tuesday 25th September and from this point on all existing Library Search links will redirect to the new system. In the meantime, the new interface can be accessed from the Library Gateway if you would like to explore it further. Users can now search within a journal in the new interface. Users won’t automatically be logged into the new Library Search interface, but they will be prompted to do so. The ‘Physical collection’ facet can be used to filter the library’s physical resources, including special collections. ‘Find in Library’ and ‘Find Online’ boxes both look a little different but the same information is displayed. Saved items will migrate to the new system, but saved searches will not. After go-live, all users currently using the saved searches feature will receive an email containing links to their search results which can then be saved into the new interface. Although the majority of issues raised by users will be addressed prior to go-live, there are inevitably some issues which will remain. Please bear with us while we make the necessary changes. There is currently a system wide issue with some publication dates not appearing in reference citations. Our supplier is aware of this and is hoping to resolve before the end of the calendar year. For some records the published date is not being populated into references when using the referencing tools and is shown as (n.d.). All students are reminded to check the accuracy of references before including them in their work.